The Quest comes supplied with wrist unit, HR belt, footpod and Movestick mini. All packaged in a neat, very appealing looking box. Other optional extras include bike accessories and GPS pod. The Quest does not have integrated GPS but gets speed and distance data from external pods (footpod, cycling or GPS). I was only able to test the footpod supplied. The advantage with the various pods (especially the GPS which uses the most battery power) is that you have a wrist unit which you can wear every day as a watch without having to recharge it every few days in order to have a working day to day watch. I really like that. Obviously having various pods means that there are more things that you can lose. I am happy to take that risk. The first impression I got when I unpacked the Quest was how small it looked compared to the Ambit, Fenix and other units we have gotten used to in the past. The Quest feels incredibly light on the arm and I hardly noticed that I was wearing it. It got the nod from my girlfriend immediately and I had the wrestle it off her arm within minutes of unpacking. What I really don’t like even on a relatively straightforward unit like this is that the Quest only has three buttons and no “back function” if you overshoot a menu. Some of you may not care about this at all but it frustrates me. Hit the start button once to select activity, again and the Quest finds the HR and footpod quickly and I was good to go. Push it again and the activity starts. Pretty simple. Then just scroll through the data pages to view the relevant info that you want. Two lines of data is displayed over several pages. One line is bigger than the secondary data line. It would be nice to have the choice of how much data is visible per page. I was initially surprised at the low level of data that was available on the wrist unit. Maybe looking at it as a “glass half full” perspective means that you have access to a relatively large amount of data (on Movescount) at a fairly cheap price compared to the Ambit or more advanced units. After all who needs to know all that info while on the run? The two pieces of info I did miss on the watch were lap distance and some form of altitude info. You can only change the number of data pages and what is displayed on them on Movescount and not on the wrist unit. If I do a longer trail race and I know that CP3 is 20km from CP2 then by having lap distance I have some idea of how far I still have to go. For those of us who run on the road it is quite nice to see one’s cadence “on the trot” without having to do arithmetic. With the use of the footpod you can monitor your cadence and work towards the golden Kenyan 90/min. 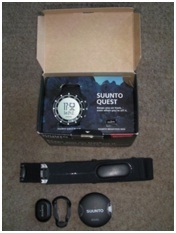 The real power of the Quest is in Movescount which is the Suunto website. Having said that the Quest is a great standalone unit if all you want to see is your info on the wrist unit. I would say it is probably the best of this test for that kind of user. Once you complete your activity the Quest will give you a few pages of summary which is quite nice. Easy enough to jot down into your Excel logbook if that is what you prefer to use. Can only see last training activity on wrist unit, not longer training history. Need Movescount for that. The bezel has got a little indicator that counts down how many hours you still have to recover from 120 downward. Suunto has the most impressive PC software of the four brands featured. Movescount is free and easy to install. It saves all your activities online. It is very easy to edit, add and plan activities. It is not possible to send these activities to the Quest for use later. It was easy to download activities. Everything seems to work quite seamlessly and smoothly. overview of your activities. Great if you want to show off to your buddies but only after you have downloaded your race info via a PC. It would be awesome if you could transfer data from the wrist unit to Movescount via your mobile phone. Bluetooth technology should make this possible. Garmin Basecamp is halfway there and other manufacturers should learn from them and take this app type thinking all the way! On Movescount mobile there is an option to track an activity using your mobile phone onto Movescount. I guess that is the main point of the app. 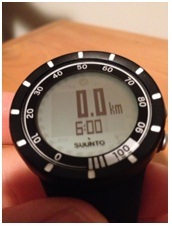 Suunto covers this growing sector of the market very well with this app. If I was using a mobile phone to track runs then this would certainly be my choice of app and the PC Movescount software. Sandes and Kilian Jornet. You can obviously also bore the rest of your twitterati and facebook friends by sending them daily updates of your every bead of sweat. All in all a great little unit. Made even better by Movescount. I hate to say it but the perfect unit for those with a smaller wrist where other units look like water wings. I have two bugs for the Quest: One is the lack of back button. I found that I always had to look at the screen to see what button to push next. The second is the only way to get a lap is to tap the screen. By tap I mean smack it fairly hard (even on its most sensitive setting) I initially did not find the Quest to be hugely intuitive to start with but got used to it quite quickly. I have used a footpod from another manufacturer for many years and besides loosing it twice and only recovering it once I still like to use a footpod to check on cadence. I would probably buy a GPS pod and use that as my main source of speed and distance. It is far less likely to get lost in Cape fynbos. 20h max data recorded to this will be perfect for most bar the few ultra junkies out there. The Suunto HR belt was by far my favourite of the test. The transceiver connects the belt on either side of it. Others should follow this example! Next Running the TMB – Guide to a circumnavigation around Mont Blanc and a traverse through three countries!